Recent release “Tender Was the Night” from Page Publishing author Melvin L. Jones is a heartwarming poetic compilation that delves into momentous joys and sorrows, revealing life in a nutshell. Melvin L. Jones, a passionate poet who has published numerous compositions, has completed his new book “Tender Was the Night”: a charming book that reflects life with thought-provoking verses and artistic proses. Published by New York City-based Page Publishing, Melvin L. Jones’s moving account covers the many dramatic moments in life, and conveys them through provoking poems that show the beauty and wonder of human emotions and wisdom. 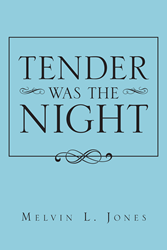 Readers who wish to experience this stirring work can purchase “Tender Was the Night” at bookstores everywhere, or online at the Apple iTunes store, Amazon, Google Play, or Barnes and Noble.